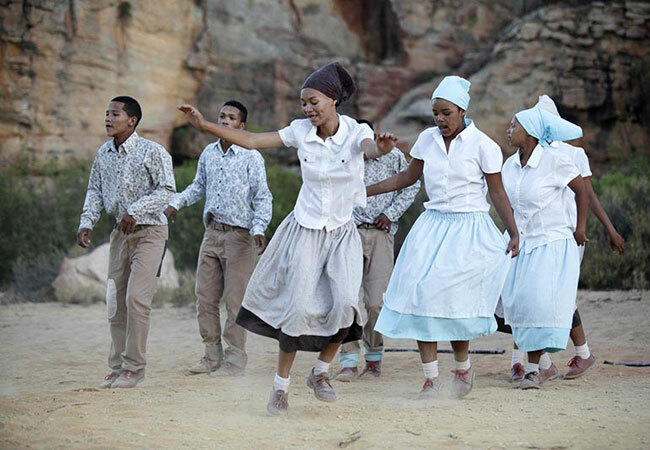 Brandvlei teens kicking up dust ahead of ATKV Riel dance competition - SABC News - Breaking news, special reports, world, business, sport coverage of all South African current events. Africa's news leader. A group of teenagers from Brandvlei in the Northern Cape are kicking up a lot of dust as they prepare for the ATKV Riel dance competitions. A group of teenagers from Brandvlei in the Northern Cape are kicking up a lot of dust as they prepare for the ATKV Riel dance competitions. Their win in 2018 has brought hope to their communities. They are called the Brandvlei Stofskoppers and that’s exactly what they do. The ancient traditional dance of the Nama people is now a national sport and they are the champions. “It still feels so unreal that we are the champions. We never thought we would be the champions one day but we worked hard for it. I don’t want to lose the trophy this year, I want to stay with us,” says Luwandri Schrader from Brandvlei Stofskopper. “It’s a lot of training and you have to put in the hard work. It’s very tiring but to do the Riel dance is something extraordinary,” says Lujean Olivier from Brandvlei Stofskopper. “You’re wasting your shoes, it’s a lot of hard work, training… sometimes your legs just doesn’t want to anymore. But it is nice,” says Bradley Loubser from Brandvlei Stofskopper. Regional competitions continue through the year, with the nationals taking place in December. The success of the Brandvlei Stopskoppers has brought hope around the Northern Cape. Riel dance groups are being established in almost every small town. They are also working hard hoping to take the trophy this year. This entry was posted on 14 Apr 2019,06:32PM at 6:32 PM and is filed under Lifestyle, Homepage Featured Story Slider. You can follow any responses to this entry through the RSS 2.0 feed. Both comments and pings are currently closed.